Dearest Cobber, A Happy 2014 to you! 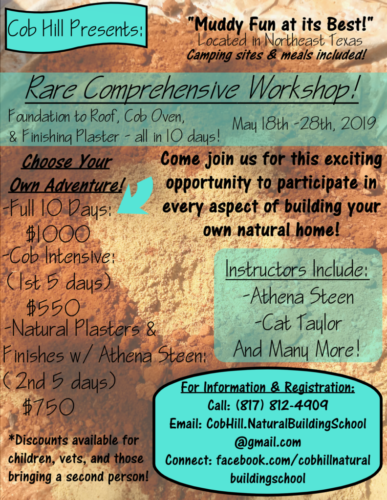 Cob Workshops is a listing for cob building workshops and events. Volunteer run since 2005! We believe cob, natural building and permaculture events are worth investing in. These views and techniques are powerful and create a better place for the earth and her inhabitants. 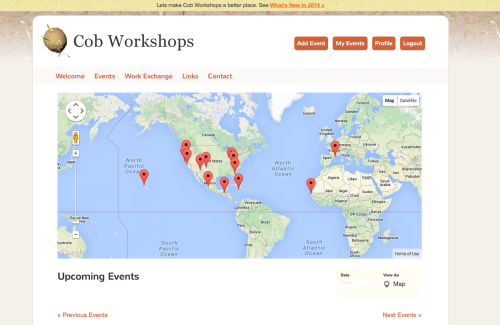 Our goal in 2014 is to make Cob Workshops a better place. We are investing in web development and software to help us meet our goals. We are asking you to contribute a small amount towards these goals – if you publish events. Member tools; add, edit and delete events in real-time. Effective January 2014. Sorry, no event authoring without an account. Collect feedback from users who care about this stuff. Location. Location. Location. Invest in Maps functionality. Responsive design – mobile development. Wsup with Work Exchange? Is there a better way? Let us know if you have a brilliant idea. Become a volunteer. We maintain a semi-curated, spam-free natural building events list.